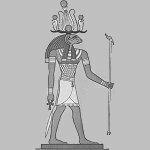 Heryshaf - Ram God Ruler of Riverbanks - Egyptian God. Heryshaf meaning He who is on his lake was an ancient ram-god whose cult was centered in Herakleopolis Magna. Heryshaf, meaning "He who is on his lake", was an ancient ram-god whose cult was centered in Herakleopolis Magna. He was a creator and fertility god who was born from the primeval waters. He was identifed with Ra and Osiris.